The Global Specialty Surfactants Market is estimated to register a significant CAGR during the forecast period. Asia-Pacific is expected to hold the largest share of the market, owing to the healthy growth of personal care industry. Personal care is one of the major end-users for specialty surfactants. Surfactants are used as ingredients in a variety of products in the personal care segment, such as foaming agents, dispersants, emulsifiers, solubilizing agents, cleansers, and conditioners, among others. The personal care industry accounted for a healthy share of the global market, in 2017. The tier-2 markets, such as South Korea, are expected to witness a rapid rise in the demand for personal care products. Moreover, China, and India are also likely to experience good opportunities for the personal care market. 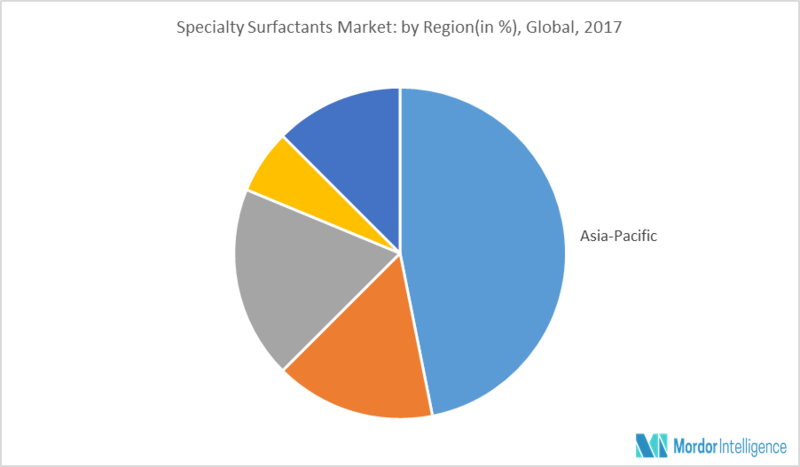 Increasing awareness about the advantages of multi-functional surfactants is expected to boost the demand for specialty surfactants during the forecast period. Household soaps & detergents account for over 50% of the total share of the market in 2017. The primary function of a surfactant in detergent is to remove soil from fabrics and to suspend the soil in the wash water. Surfactants in dishwasher detergents are used for wetting surfaces to help soil removal. The surfactant level in automatic dishwasher detergents is lower than in hand dishwash detergents to minimize foaming in the dishwasher. The major surfactants used are LAS, alcohol ethoxysulfates (AES). China was the largest consumer of surfactants in 2017 and the country is likely to continue its dominance during the forecast period. Continuous growth in population is a factor fuelling the demand for cosmetics in the country. China is one of the top ten markets for cosmetics export from developed economies, such as the United States. The growth of population, which lies in the ages between 20 and 30 years, is the major factor contributing for the increasing cosmetics demand in China. This scenario is estimated to continue during the forecast period, which in turn, is expected to propel the demand for surfactants in the cosmetics industry in China. Major Players: BASF SE, Stepan Co., DowDuPont, Kao Corporation, and 3M, among others.